It can be tough to say what needs saying when what needs saying might hurt someone you love — but it’s usually worth it, in some way or another. This was the lesson of Modern Family last night and we related, because we are human beings with families that we love but whose shortcomings in life we have strong feelings about. So, what do you do when someone you love does something you do not love? Let’s see what the extended Pritchett family learned. Manny has seemingly recovered from last week’s existential/lepidopterial crisis (did we not mention how apparently he’s afraid of butterflies? Because he is! And Gloria forgot and told him heaven was full of butterflies. And he screamed and ran out of the room! It was amusing and affecting), but Jay and Gloria are still throwing down over various cultural conflicts. Once again, it’s Gloria’s Meaningful Latin Tradition vs. Jay’s Desire to Play Golf This Afternoon. Gloria wins out, toting Jay off to an employee’s daughter’s quinceañera, about which his question is, “What’s a quinceañera?” (it’s a blowout birthday party for girls when they turn 15) and about which our question is, “Jay has employees?” He was aware of this fact, at least, but not much more. 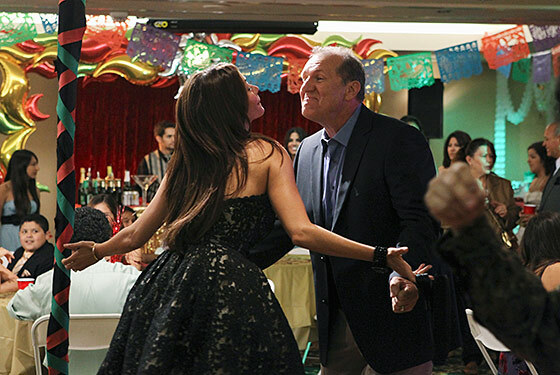 To prove to Gloria that he cares deeply about the people who work for him, he spends the party dragging Manny around, paying $2 for every guest the kid introduces him to, schmoozing and boozing with — well, with real actual total strangers, actually, because Gloria has accidentally taken them to the wrong party. At least Jay made friends with somebody’s employees. We’d say that tensions were still running high between Mitchell and Cameron after the Pepper incident last week, but tensions are always running high between Mitchell and Cameron. But guess what else is running? Cameron! He’s decided to get his teddy-bear-esque physique in order, which Mitchell is proud of him for — but he’s not so proud of his choice in workout attire, namely the shiny blue bike shorts that apparently have been cause for conflict between the guys in the past. Mitch isn’t super-specific about why he hates Cam in the shorts, but the giant pixelated censor blob superimposed over his crotchal area throughout the entire episode says enough. Mitchell is also running, on side-by-side treadmills, with his sister Claire, when he decides that they, as siblings, should do each others’ dirty work: She’ll gently approach the subject of the awful shorts with Cam, and Mitch will gently approach the subject of Phil’s — ah, hold on, more on that in a bit. Mitch’s plan backfires in pretty much exactly the way you’d expect, and then continued to backfire in ways that were even more delightful (“I hate your beard … I have always found your beard off-putting”). Last week, Phil essentially trapped Claire and a plumber in the upstairs bathroom for several hours while he bumbled around trying to fix the cabinet that he told Claire he fixed months ago but didn’t. We imagine her awareness of this fact would have made this week’s task — telling Phil that he’s not as funny as he thinks he is before he bombs as the emcee at a big real-estate-industry dinner — a little bit easier. “It’s not that he’s not fun, because he’s so fun. He’s just not funny. It’s probably my fault because I laugh at all his jokes. With my mouth, not my eyes,” she says. In exchange for confronting Cam about his bike shorts, she gets Mitch to talk to Phil; when that fails, she resorts to stealing his note-card stack of meticulously prepared stinkers just before the big speech. She’s aiming to force him into something between “floundering” and “crashing and burning,” but he does great, of course, because Phil Dunphy is a really funny guy, just not when he’s trying to be, which is basically all the time, so who would have known? After the dinner, Claire and Phil return home arm in arm, all lovey-dovey, and it looks like we might get another one of those voice-over montages of all the families doing various things that show they’ve all reconciled their many differences for the week — but we don’t! A flip of the living-room light switch shows a despondent Alex sulking on the floor, led astray by Haley in an attempt to get in with a popular girl at school: “I don’t have any friends.” Yikes. In the moment that Claire pulls off her heels and sinks to the floor next to her, the usual sweet-and-sour dichotomy doesn’t really work — there’s no joke (not until the post-credits coda, at least), but no warm-fuzzy platitudes, either. For a show whose point may very well be the fine execution of a hundred small moments, it was one of the best.